A cay, also known as a key (and pronounced exactly the same) is a small, low island formed over a coral reef platform. There are hundreds of sandy cays in the Bahamas, surrounded by shallow turquoise water and populated with exotic birds, palm trees and pigs. Cruise lines that sail around and through the Bahamas bought some of these cays to use as ports of call for “beach days.” Here are five privately owned cays reachable by cruise ship. Voted best cruise line private island by readers of CruiseCritic, this 1,000-acre cay was once called Gorda Cay and was used as a stop for bootleggers and drug runners. This is where Tom Hanks met Darryl Hannah, the mysterious mermaid, in the movie Splash. Some Pirates of the Caribbean movies were filmed here as well. Disney Cruise Line did not buy the island outright, but secured a 99-year lease from the Bahamian government in 1997. Around 60 employees of the Disney company are the only permanent residents of Castaway Cay, but it is rarely deserted. Cruise ships are able to dock here, thanks to some deep dredging and a long pier constructed by Disney. Thousands of visitors disembark to enjoy the beaches and recreational areas which look like they were constructed from shipwreck salvage. 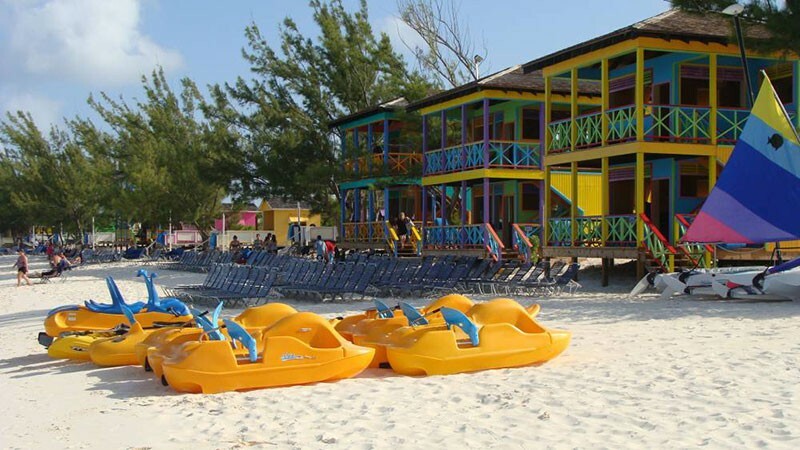 Some of the activities offered are snorkeling, parasailing, personal watercraft rentals, beach volleyball and bicycle rentals. This cay was once known as Little San Salvador Island and was owned by Norwegian Cruise Line before Holland America Line bought the 2,400-acre island in 1996 for $6 million. Holland America has since developed about 50 acres, and vows to leave the rest of the habitat for wildlife. If you think you’ve been here on a Carnival Cruise, you probably have. Carnival Corp. owns Holland America line, so its ships also use the island’s amenities. 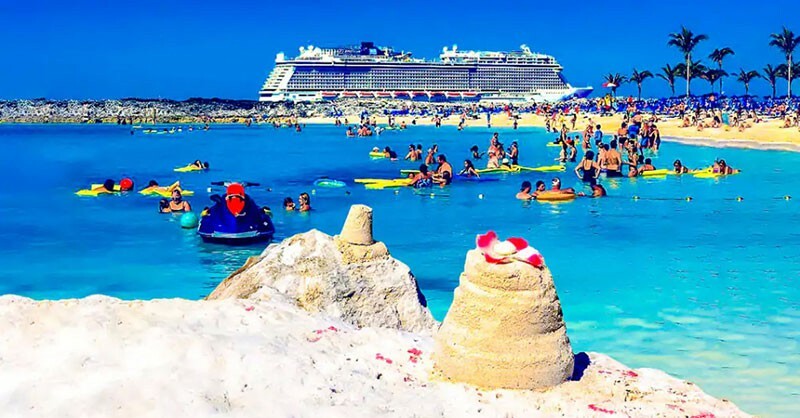 Half Moon Cay is located less than 100 miles southeast of Nassau, and provides a beach playground for sunning, snorkeling and swimming in the clear waters. There is no place to dock a large ship, so visitors generally are tendered to shore from an anchored cruise ship. Shopping is a bit limited here, but there is a Captain Morgan Bar, a lobster shack, and a free barbecue buffet along with the clean 2.5-mile soft-sand beach. For something a little more unusual, you can ride horses through the shallow surf at the water’s edge. 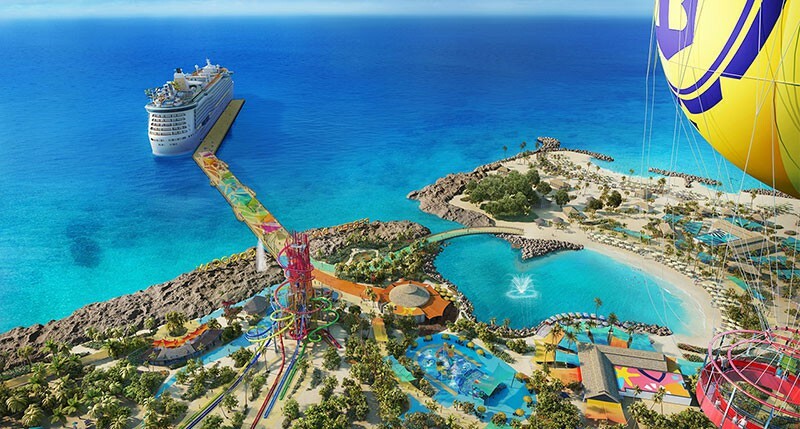 For a Bahamas island that’s more like an adventure water park, visit Royal Caribbean’s CocoCay. Advertised as “Your Perfect Day,” it has a terrifying zip line across the island, and North America’s tallest water slide – called Daredevil’s Peak. The Caribbean’s largest wave pool is also found here. The island was once called Little Stirrup Cay and sits 55 miles north of Nassau, in the Berry Islands. 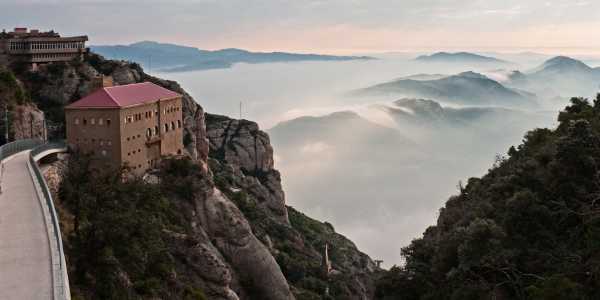 It is exclusively for the use of Royal Caribbean passengers, and the only way to visit is through one of their cruises. 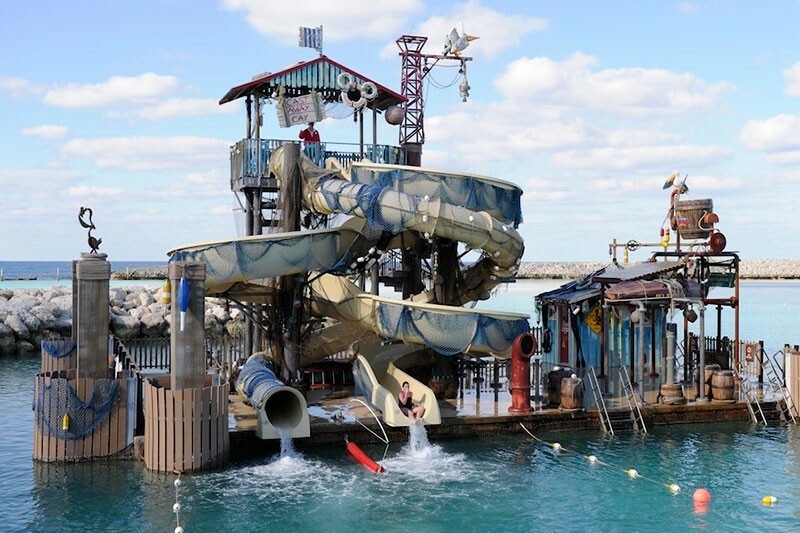 There are tiki bars, lagoons and pools all over the small island, so relaxation is an option if you don’t need the excitement of the water park. The water around CocoCay is clear and shallow, so you can walk off the beach into some good snorkeling grounds where small sharks and rays can be found. 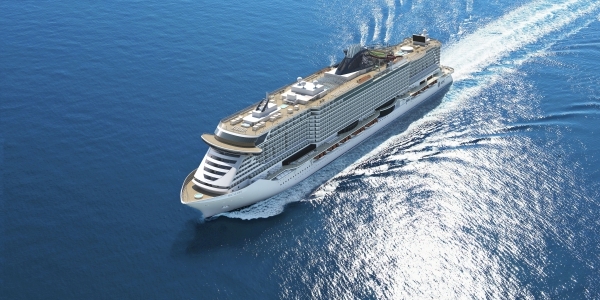 The food is included in cruise fare, and features a buffet barbecue, ice cream and all the trimmings. If the day isn’t perfect enough, there is a hammock park in the shade where you can take a quiet nap. Part of the Berry Islands of the Bahamas, Great Stirrup Cay was the first private island offered by a cruise line for its passengers. Norwegian Cruise Line bought the 268-acre island from Belcher Oil Company in 1977 and now offers its beaches, 19th-century lighthouse and coconut plantation for a beach-day shore excursion. NCL has spent more than 25 million dollars on facilities and amenities, including a port center with shops, restaurants and bars. This is where the small tender boats dock, since the shallow port can’t accommodate the cruise ships. You can rent water equipment here, beach shelters (“clam shells”) and if you’d like to explore, an ATV. There are three beaches suitable for sunning, swimming, snorkeling and sipping slushy umbrella drinks from the nearby tiki bar. One noteworthy feature is the underwater sculpture garden where snorkelers will find mermaids, sea monsters, and fountains. 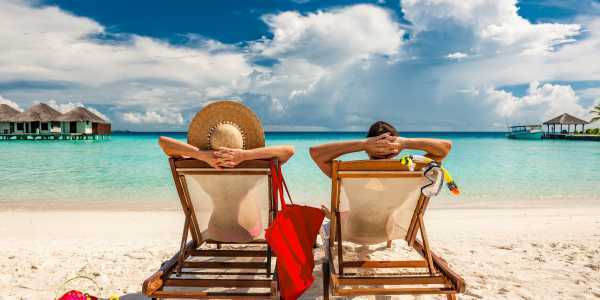 For more fun in the sun, the island offers parasailing, wave runner tours, stand-up paddleboard rentals, three barbecue buffets and plenty of island cocktails. The island of Eleuthera is one hundred miles long and two miles wide, located around 30 miles east of Nassau. 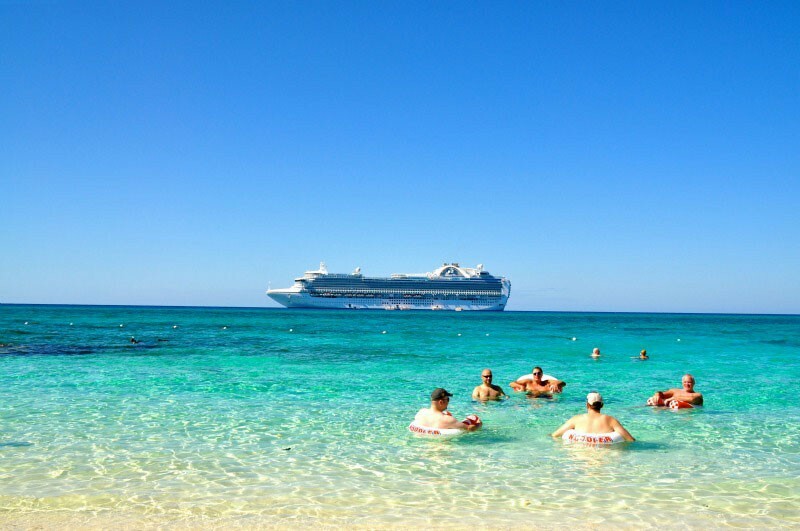 It is not entirely owned by Princess Cruises, but a 40-acre section of the lower island is owned by Princess for the exclusive use of its cruise passengers. This island has some incredible beaches and large stands of mangrove trees along the shore. Water activities include small boat rentals like Hobie Cat and Sunfish sailboats, paddle wheelers, and kayaks - some with transparent hulls. For a thrill ride, you can hop aboard a banana boat and zoom around the shallow waters at top speeds, enjoying the spray of the ocean waves.